My dear friend died of a heart attack on Interstate 40, September 14, 2017. This is the eulogy I delivered at Faithbridge Church in Spring, Texas, October 5. I thought I was Lou’s only friend. That is how he made you feel. We meet in 1974 a few years after he had recovered from cancer. His medical team advised if he lived two years he had a good chance of living a long life. Lou considered every day a gift. He was always enthusiastic, brought great joy to my life and to everyone he met. Like me, Lou was raised in a military family. We inherited the hairstyle. In a military family you learn to make your bed and to take a stand. You place high value on tradition, loyalty and being of service to others. Through the years we shared many memorable adventures: boating at the lake, OU game day at Lou’s campus corner restaurant Louie’s Chili Bowl (a hot dog you can trust), his nightclub Zanzibar that showcased his love for 70s Soul music. One weekend in Norman in the early 80s Lou suggested we watch Caddy Shack. He had no beer in his house. Drinking wasn’t his thing so we binged on milk and Hostess Twinkies. Our theme song was “Born to be Mild.” When I returned to Tulsa I mailed Lou a note and a case of Twinkies. We laughed about that for years. Lou and I spoke two or three times a week through good times and the inevitable valleys that seemed to never be as dark for him. For Lou the glass was always half full. He was the first person I would call about anything. If either of us was taking a long road trip it was our tradition to call the other, usually late at night when we were growing tired. We shared everything worth sharing and laughed how our friendship saved a bundle on psychotherapy. For several weeks Lou had been speaking about his trip to Santa Fe for his 50th high school reunion and how he was excited to reunite with his classmates. We agreed he would stay the night with me in Oklahoma City on his way. We had a great time at dinner with some of my high school friends. Lou had lamb chops. “It was delicious,” he said. The next morning we had granola, shared a few laughs and made plans for him staying over the following week on his way home. The Oklahoma State Trooper called me from his phone a few hours later. I was his last call. After I recovered Lou’s belongings from his car I drove west to Oklahoma mile marker 14, near the Texas line, where the Trooper said Lou had left the road. I wanted to see what Lou had seen and there it was: Wide open country. Green rolling hills. A cloudless blue sky, a highway heading off into the horizon, into the promise of a tomorrow that may never come. Over the last four years Lou had been a source of strength when I lost my brothers so I was eager to be there for Louis and Landon and Jeanne. I would have kept those fortunes, too. Lou’s passion and his purpose were to befriend, encourage and inspire others. It will be difficult for me today, but I will live my life to be more like Lou. I will pursue my dreams and do my best to smile as if I was looking at him. When I reached mile marker 14 the sun was setting, the time of day when the light is most spectacular, an irony not lost on me. I stood there for the longest time. Cars and trucks roared past. The Oklahoma wind graced my face. I stood there until it became clear to me, until I was certain Lou’s last thoughts were of Louis and Landon and all the joy one life can know. Thank you for your comments and for sharing. A year has passed. Lou was my dearest friend, irreplaceable in this life. Be well. Thank you, Ralph, for the exquisitely beautiful, deeply personal tribute to Lou and your friendship. We were all stunned and saddened to hear of Lou’s death, on his way to celebrate with us. We really missed him. 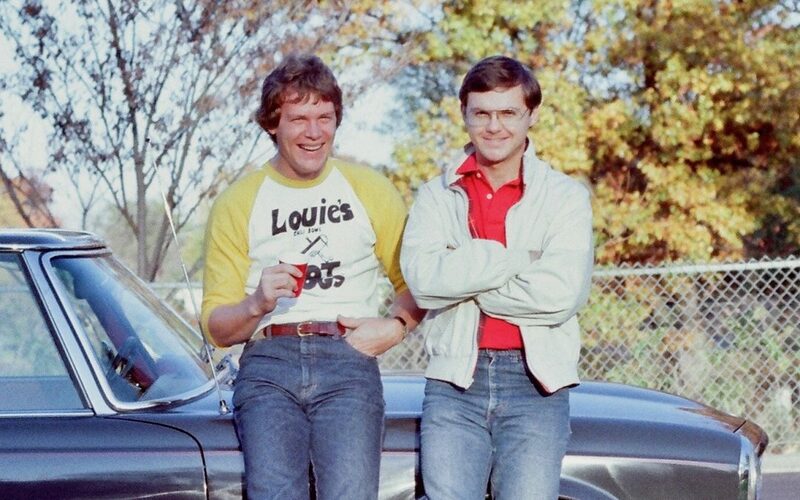 I knew Lou in high school to be easy going, friendly; always smiling. Thanks for the window into his adult life. Hi Cathy. Nearing the anniversary of Lou’s passing I reread this eulogy. Still a heartbreaking loss. He was an irreplaceable blessing. My novel Angel City Singles is dedicated in part to Louis and his contribution to my life. Late at night, when I was editing, I would often call Lou. He would listen patiently to a paragraph and say, “Good one.” He was exceptional. Thank you for your note and for sharing. We learned to fish and ski together at our family cottages on Mullett Lake. I loved him the moment I met him – and have loved him ever since – I considered him my “little brother”. He was looking forward to his high school reunion last September, and my husband and I were making plans to go see him after that because we had not seen him in a few years. I last talked to him ust a couple of days before he left for the reunion, and we were excited about getting together a few months later! Then, his cousin called and told me he had passed away. I was stunned! My life changed that very moment. I felt numb! Today mark’s the anniversary of his death – nothing is the same. I miss him with all my heart. I will always love him. He was one of a kind – my parents nicknamed him “Mr. Personality” when he was a small child, and that was SO fitting! I feel very blessed to have had him in my life! My love and prayers to his family … Louis, Landon, Jeanne and Fran (his sister). A long and difficult day for me as they have been, in many ways, since Lou passed. As I shared in his eulogy, Lou made you feel like you were his only friend. We called him “Captain America” but only when needed. Thank you Myrna. Until this morning I was unaware of Lou’s passing until somehow I came across this beautiful eulogy. What a great friend you were to Lou. Thanks for sharing.